Making skating blades tradionally was the job of a blacksmith. He had fire, anvil, heavy hammers and stout biceps at his disposal to force iron and steel into a pair of elegant ice skates. He had the platforms supplied by a carpenter and the straps by a leather shop. 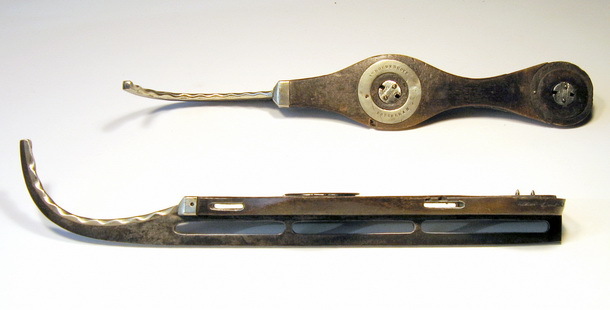 So, when in the middle of the 19th century a knife maker makes a pair of ice skates this may be considered as rather unusual. Generally a knife maker worked with different materials and techniques and also much more precise. 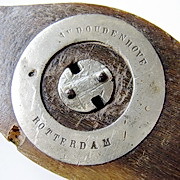 The shown ice skates were made around 1860 by the Rotterdam knife maker A. van den Oudehove. They show interesting details. The silvery metal is an alloy of nickel, copper and zinc called alpaca. It is used by silver smiths as an imitation of silver and then called Berlin silver. On cleaning the platforms it appeared that these were not made from wood but from horn or a hornlike synthetic material. Most likely it concerns keratin a material made from milk proteins. Detail 1 shows that this material is a bit transparent when held against light. 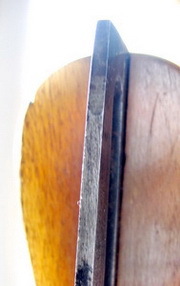 The photo also shows a kind of fibre structure which seems to hint in the direction of a bond with cellulose. 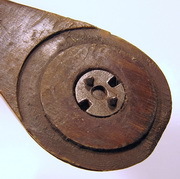 It might be that this is the same material from which handles for knives were made at that time. 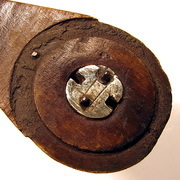 It is a pity two rings in the heel part of the platforms are no longer present. The grooves indicate they have been there (details 2 and 3). It is assumed these rings were made of alpaca as well. The pictures also show a difference between the nuts. Both nuts were covered by alpaca too but one of them lost its head. Altogether an unusual pair of ice skates that are wearing the name of their designer and maker proudly. He most likely made them for his own use. © 2002-12 The virtual Ice Skates Museum. All rights reserved.